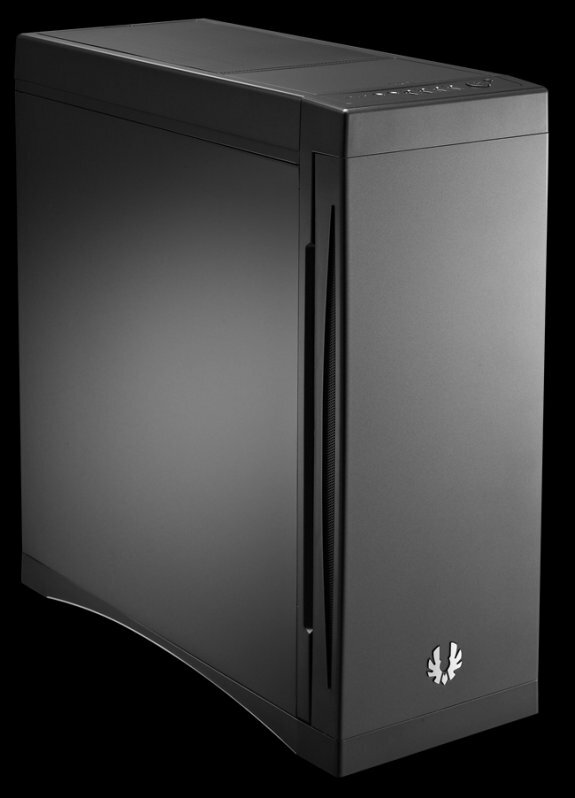 BitFenix introduces Ghost, the company's first case that focuses on silent computing. This new mid-tower is made from steel and has a plastic front, it has a full-black design and supports Mini-ITX, mATX and ATX cases. Measuring 210mm x 522mm x 510mm, it offers three 5.25" drive bays, four 3.5" HDD bays, and three dedicated 2.5" drive bays (seven in total). 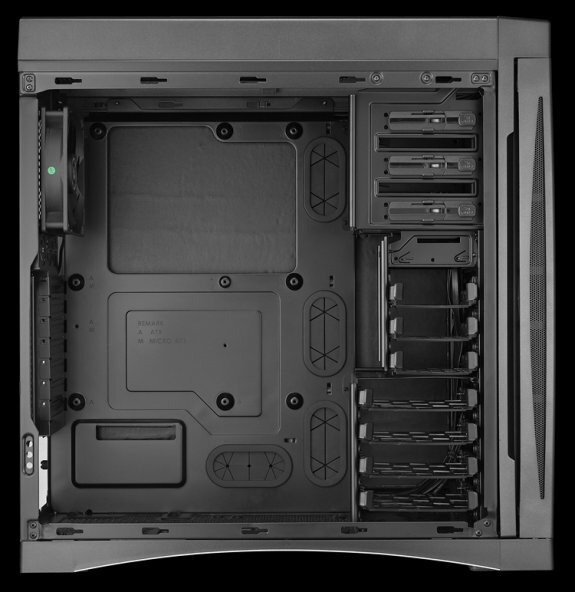 Inside are seven PCI slots and, depending on fan size, there's room for up to six fans (two 120mm fans are included). The interior is much like you'd expect from a contemporary gaming case, with tool-free installation and the usual cut-outs for cable management. The top I/O panel offers two USB 3.0 ports, two USB 2.0 ports, audio ports and a hot-swap SATA 6Gbps bay. To achieve silent computing, the case is equipped with noise-dampening material, low-noise fans, anti-vibration HDD trays, and rubber grommets and padding for the PSU. Ghost will start shipping by the end of the month for 89EUR ($99). Ghost begins with a modern minimalistic look that blends into virtually any decor. Its clean lines are supported by a single silver arch, the shape of which is mirrored perfectly by the front door vents. Coating the outside is a new surface treatment from BitFenix dubbed NanoChrome™. This specially developed coating combines an enamel with mother-of-pearl powder, which is then applied to the surface of the case and heated to high temperatures. The result is a uniform finish that perfectly blends together both plastic and metal parts. Opening the front door reveals BitFenix Serenitek™ silencing material. Dense yet light weight, Serenitek covers the inside of both the front door and the two side panels to help trap unwanted noise inside the chassis. The door itself is a dual hinge design, which allows users to open the front door from the left or from the right on-the-fly. Up top are two USB 3.0 and two USB 2.0 ports, as well as the BitFenix S4™. This compartment is equipped with a hot-swap bay that features a high speed SATA III port, making it ideal for transferring data from hard disks and SSDs without having to open up the case. Best of all, removing the top fan filter reveals a cavernous compartment designed to accommodate a slim 240mm radiator, making Ghost a perfect foundation for a silent water cooled rig of destruction. On the bottom of the case, you'll find a handy magnetic dust filter, as well as dual rails that are designed for BitFenix Alchemy LED Strips. Simply affix the LED strips to these rails, route the power cables through the pre-drilled holes in the steel body, and you've got an impressive under lighting effect in no time at all.